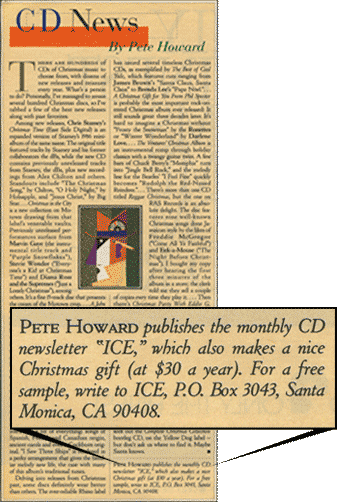 The look of Pete Howard’s “CD News” column in Rolling Stone magazine changed quite a bit over the course of its seven years (1988-1994). In his column as Contributing Editor, Pete would tell readers of all the interesting, upcoming CD releases from record labels, especially reissues. Frequently Pete would be allowed to plug his ICE newsletter, with address check, at the end of the column.